This last Sunday had to be one of the best days (weather wise) yet this year! Of course I took the opportunity to do some work on the GS. I left off with at a point in the Clymer manual tune-up procedure where I had to check and adjust clearances on the points and then go on to do a static timing adjustment as well. So I pretty much just picked up where I left off. I used feeler gauges to check and adjust the points clearance which was a within tolerance but I figured I’d get it back to the center of the range. In the picture below you can see a feeler gauge in between the points contacts. An astute reader might notice that the feeler gauge I have in there is much too small of a tolerance for the points, I caught on to that fact shortly after checking the numbers again. The tricky part of feeler gauges is in the root of the first part of the tools name, “Feel.” I have never been comfortable with these tools ever since tearing the top end of my SV650 apart three times trying to adjust the valves and never getting it exactly right and finally having to take it to a repair shop and having them do it. You really need to know what the right feel is for the adjustment to be proper. The book gives a pretty good description of how it should feel so I am more confident this time at taking on the task of adjusting the points clearance. Once you get the points clearance done you move on to setting the static timing and this is where I have run into a couple of issues. I have a multi-meter (See first picture) but really have no experience with it. Clymer said to start with the left cylinder by rotating the crank to adjust the crank to where the "F" mark for the left cylinder is aligned with the mark on the engine cover. When you have that done you are supposed to use a continuity tester connected to the terminal (where the white wire connects in the above picture for the left cylinder) and a ground on the engine. At which point you loosen the screws on the breaker plate (at around 11:30 and 5:30 on the breaker plate in the picture above) and rotate it until the continuity tester indicates that the points had just began to open. When you loosen those screws you can see that there are slots that allow adjustment clock-wise and counter clock-wise in a certain range. When the engine is running there is a shaft running through the center of the breaker plate that has an eccentric cam that is will spin. As that cam rotates is actuates the two armatures (Circled in red in the picture below) that ride along the on the cam to open and close the points as the shaft spins. I figured if I had the multi-meter set to resistance it should read 0 ohms when the points were closed and "infinity" when the points opened. This is where I had my two issues come up. Issue 1: When rotating the breaker plate I could only get the points to visually (barely) open when the breaker plate was adjusted to the extreme of the range of motion in the counter clockwise direction. 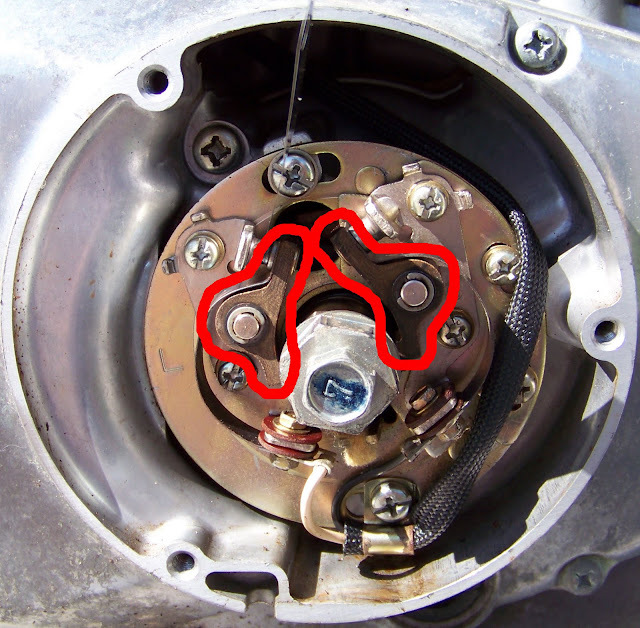 Question 1: Is it possible for these armatures (circled in the picture above) to wear out at the point where they ride along the eccentric cam that opens and closes to a point where that will cause this extreme adjustment to be necessary and when you buy points does it come with replacement armatures (keeping in mind that the bike has nearly 20,000 miles on it)? Issue 2: Even when I manually open the points the multi-meter still reads 0 ohms it never goes to infinity, so I am doing something wrong there. Question 2: Should I be using a different setting to test continuity on my multi-meter or do I need a completely different tool? I am still working on getting these questions answered on caferacer.net as well as my other motorcycle site I frequent madisonsportbikes.com but if you are reading this and can offer some advice I would appreciate it. After hitting that dead end I still wanted to feel like I accomplished some things so I took some parts off and did some fixing to make me feel better about the day. The first thing that I have been meaning to do is pull off the slip-on silencers that are on the bike, as they are the wrong size. The outside diameter of the header pipe is way too small for the inside diameter of the silencers. 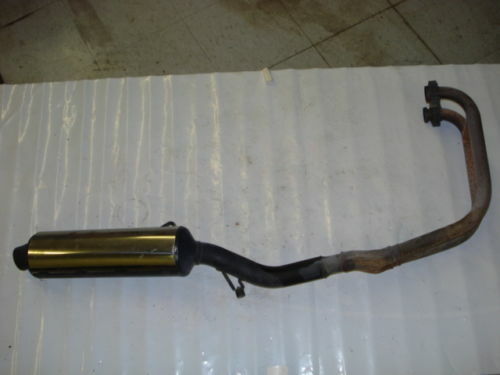 Even when the clamps have joining end of the silencer completely pinched down the silencer does not fully clamp down on the header pipe and the exhaust leaks thus making the silencers mostly cosmetic. I found if funny upon removing the silencers to find out that they are actually Harley Davidson silencers, so was the rearview mirror that I took off and the leather handgrips that I took off to me means that the previous owner was basically screaming I want this bike to be a Harley! Well it’s not… so off they come. I am actually thinking of seeing about sourcing a 2-into-1 stock system off a 90’s GS500e (below) if it will fit. I will need to do some further research into that one and it would have to be a local find because shipping one of those would easily double the cost of the system. The next thing that I tackled was the rear brake pedal, the portion where your foot would normally press down was basically bent 90 degrees probably from the same crash that bent the headlight mounts and broke off the right mirror. You can see what it looked like when mounted on the bike in the very first picture of this post. After pulling the pedal off , I cobbled together a vise that would be able to hold the lever while I was beating on it with a hammer and also serve as a template to put the foot portion back flat again. Below you can see what I came up with. I was concerned that like most Japanese foot and hand controls I have encountered in the past that it was going to be good for the one bend and once I tried to bend it back that it was just going to snap, but the 1979 levers are definitely made of stronger material and it bent back into place just fine. I understand that you get a lot more mess everywhere without it on the bike but I do like the look without the guard on there. The chain is not in very good shape for now it will be fine I may try and clean it up and if in the long run I see this bike sticking around as my personal bike for a long time I will look into chain and sprockets but for now I am just working on getting this bike running well and not spending too much money, it’s future will be decided at a later date. I am still a little jaded about the bike turning out to be an “L” model but If I can come up with something fun to do with it after it is running well it will stay around and the project will continue. In the immediate future, once I get some more input about my static timing issues I will move ahead with that portion of the project and there are plenty of other things to work on in the interim. Expect another blog post shortly as I have more free time tomorrow and might tackle something else!